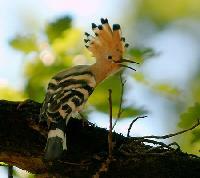 The Hoopoe, a colorful bird that is found across Afro-Eurasia, is notable for its distinctive crown of feathers. It is the only extant species in the family Upupidae. One insular species, the Giant Hoopoe of Saint Helena, is extinct, and the Madagascar subspecies of the Hoopoe is sometimes elevated to a full species. 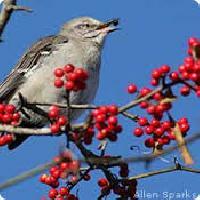 Like the Latin name upupa, the English name is an onomatopoetic form which imitates the cry of the bird. The Birds of Paradise are members of the family Paradisaeidae of the order Passeriformes. The majority of species in this family are found on the island of New Guinea and its satellites, with a few species occurring in the Moluccas and eastern Australia. Its likely that you will only see them on film, though, because they mostly live in inaccessible, dense rainforest habitats. The Atlantic Puffin (Fratercula arctica) is a seabird species in the auk family. It is a pelagic bird that feeds primarily by diving for fish, but also eats other sea creatures, such as squid and crustaceans. 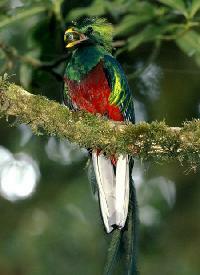 Its most obvious characteristic during the breeding season is its brightly colored bill. Also known as the Common Puffin, it is the only puffin species which is found in the Atlantic Ocean. 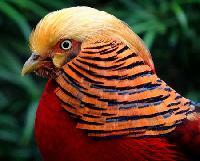 The curious appearance of the bird, with its large colorful bill and its striking piebald plumage, has given rise to nicknames such as clown of the ocean and sea rooster. 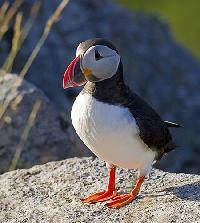 The Atlantic Puffin is the provincial bird for the Canadian province of Newfoundland and Labrador. The Lears Macaw (Anodorhynchus leari), also known as the Indigo Macaw, is a large, all blue Brazilian parrot that is a member of a large group of Neotropical parrots known as macaws. It was first described by Charles Lucien Bonaparte in 1856. The Lears Macaw is 70?75 cm. (28?30 in.) long and weighs around 950 g. (2.1 lb.). It is metallic blue with a faint, often barely visible tinge of green, and a yellow patch of skin at the base of the heavy, black bill. This macaw is rare with a highly restricted range. Stork-billed Kingfishers eat mainly fish, using their large heavy bills effectively to catch and kill their prey. From their perch, usually about 2-4 m. above the water, they will plunge into the water. They also eat crabs, insects, frogs, mice, lizards, and birds, along with their eggs. Prey is brought back and whacked senseless against the perch.They usually hunt near freshwater and along coasts and mangroves, particularly in habitats with suitable perches. Unlike the Collared, Stork-billed Kingfishers are rarely found near urban areas.